The first ITB China was held in Shanghai, China from 10th to 12th May 2017. Some 600 exhibiting companies from nearly 70 countries and regions met with a total of over 10,000 attendees and buyers, ITB China marked its premiere and proved its importance as China’s new marketplace for the travel trade industry. ITB China is a three-day business to business travel trade fair that focuses exclusively on the Chinese travel industry. It had been quite a busy three days and it offered lots of fabulous opportunities for discussion, networking and making new valuable industry contacts during the Opening Dinner, Cruise Night and After-show Parties. 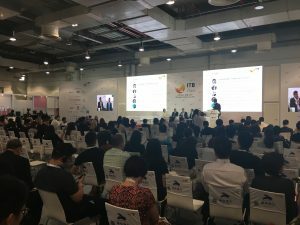 The ITB China conference also registered high levels of attendance. A total of 2,700 attendees took part in the keynotes and penal discussion sessions given by 70 industry speakers. The first panel discussion for ITB China conference on the opening day was moderated by Yearth Group’s Founder & CEO, Mr Joseph Xia, together with speakers such as the SVP of Genting Cruise Lines (Ms Christine Li), The General Manager of Greater China of Finnair (Mr Robert Öhrnberg) and the Vice President of Asia Maritim Hotels (Ms Huilian Duan). 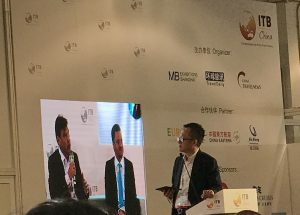 These well experienced executives in the travel industry shared many useful and practical tips on “How destinations leverage digital tools to engage with Chinese travelers and build awareness”. The date for ITB China 2018 is already set from May 16 to 18, 2018 at Shanghai World Expo Exhibition and Convention Centre. Mark it down in your calendar and we are looking forward to meeting you at ITB China next year!